The Circle Bar B Guest Ranch is an ideal location for your special day as it offers both the seclusion of a private ranch wedding and the opportunity to enjoy the natural beauty that defines Southern California. Our property features some of the most beautiful ceremony sites on the California Coast and can accommodate up to 150 event guests. Whether it is elegant simplicity, rustic luxury, or country glamour that you seek, let the Circle Bar B Guest Ranch be a part of your special day. Venue- The cost of the venue includes access to the entire property and exclusive use of the ranch and all of the amenities we have to offer. The cost of the venue also, includes your use of the property for the weekend for the ceremony, reception, and rehearsal dinner. You will be able to enjoy all of our facilities and enjoy time with your family and friends in a gorgeous and secluded setting. Food & Beverage- Breakfast and dinner are included in the cost of the accommodations for the overnight guests. 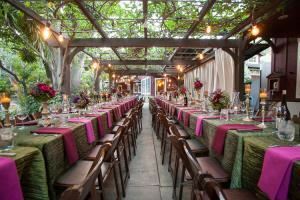 Additional guests are paid for on a per person basis for the rehearsal dinner and the reception dinner, and the cost is contingent on the specific menu. We have a full-service bar to provide drinks for you and your guests during the entire weekend. We have several different types of wine, beer, and top shelf liquors to make your favorite drinks. We can stock our bar with any alcohol of your choice and customize our drink offerings to your personal preferences and offer the options of signature cocktails, full hosted open bar, and more. Special Features: With 18 overnight accommodations offering a variety of room and cabin styles that sleep up to 68, the ranch is a perfect destination wedding location where you and your wedding guests can enjoy the entire weekend together.